Putting this on our Travel Blog is a bit of a stretch. But here we go! 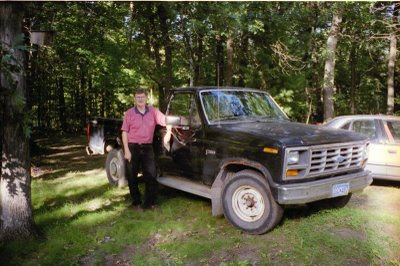 About seven years ago, I was fortunate to find a Ford F-250 pickup truck available for $50. Mind you, it wasn't perfect. A broken windshield, slipping clutch, broken anti-pollution air pump. O yeah, one of its two gas tanks leaked and was disconnected, and the tires were bald. And a few other problems, too. She had to have a name. "Black Beauty," I thought, and so it has been for seven years. I had the clutch replaced, made a few minor repairs - like pulling out a couple of large dents with a toilet plunger - and she proudly took up residence in a garage stall at the lake. Each spring, she takes the boat down to the landing. In the summer she makes a few runs to the town dump. In the fall, it's back to the boat landing and she gets her tank topped off as a reward. Hey! What's this fuzzy stuff under the clutch spring? How did that get in there? 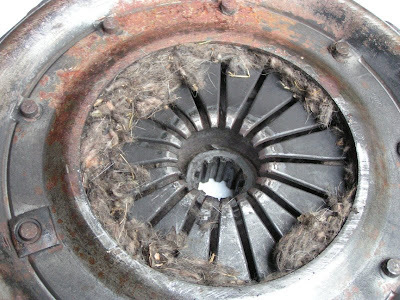 OK, pull the pressure plate, slip off the clutch disk and clean out lots more fuzzy stuff. Lay it out and let's have a good look! Say, is that a mouse? 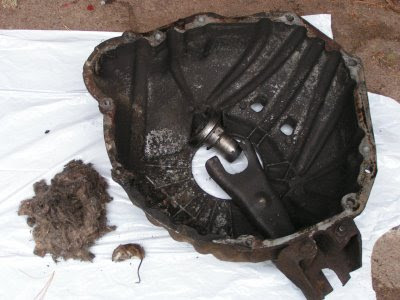 Inside the clutch? Can't be! There is a narrow slot on the bottom of the F-250 clutch housing. It might be 3/8" wide at the most and a couple of inches long. Big enough for a mouse to crawl in and build a nice little nest. Probably very comfortable over the long Wisconsin winter. 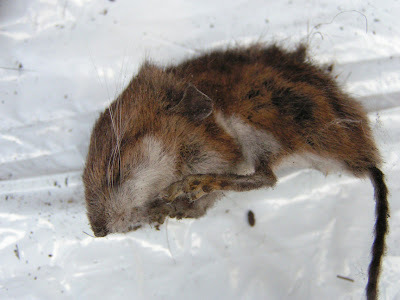 A mouse in a clutch? I've asked a lot of professional and amateur mechanics about this over the past few years and no one has ever heard of it happening. But sometimes life is stranger than fiction. Sadly, after seven happy years together, Black Beauty and I must split up. Congress has passed and the president has signed the "Cash for Clunkers" bill creating the Car Allowance Rebate System (CARS) This increases Black Beauty's value to $4,500 from July 1 (or whenever the NHTSA figures out how to implement it) until November 1.